Whitehorse, Yukon – Whitehorse RCMP are investigating a series of tire slashings that occurred downtown Whitehorse on the evening of March 17th, 2019 or early morning on March 18, 2019. 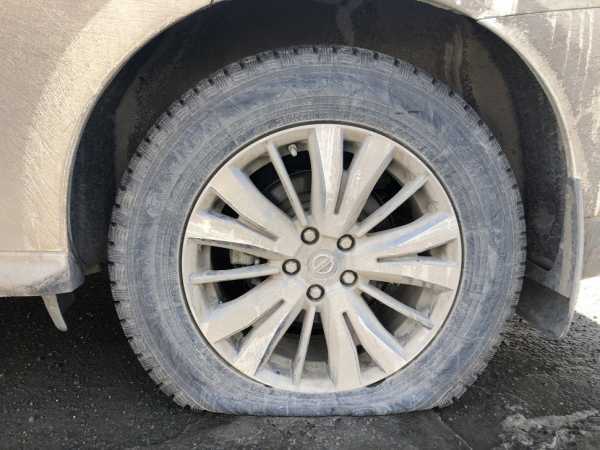 Multiple tires were slashed on more than a dozen vehicles located along Sixth Avenue between Strickland and Jarvis Streets, and near Third Avenue and Wood Street. If you have been victimized by these acts of mischief, or if you witnessed any suspicious individuals or activities in these areas late last night or early this morning, please contact Whitehorse RCMP at 867-667-5555. Slashed tire, downtown Whitehorse, March 17, 2019.